Just over a months ago now we welcomed Rachel, Ross, Eilidh, Heather, Jess, Nathan, Anah, Ken, Calvin and Sam to beautiful South West Scotland for our annual GO Team! This year’s team consisted of ten people – five from Scotland and five from Ireland! Six of them were here last year, and two were doing their very first team! We also had Jude around as an honorary team member! The main work of the team was to organise our Family Fun Day, but we fitted in a few other things when they were here, starting with a viewing of the movie ‘Calvinist‘ with some of the congregation on Friday night. The team joined the congregation for the prayer meeting and worship on the Lord’s Day morning, followed by a church lunch. After lunch, we went round to Dalrymple Court (sheltered housing), where Stephen and Jude introduced some psalms, which we sang with the residents, before spending some time chatting with them. In the evening, the team were with the congregation for worship and supper afterwards. 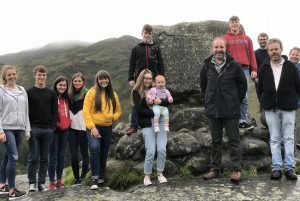 On Monday morning we had a prayer time, before heading to Glentrool in Galloway Forest Park to see the grave of six Covenanters who were shot while praying on 23 January 1685. The inscription reads: HERE LYES JAMES AND ROBERT DUNS, THOMAS AND JOHN STEVENSONS, JAMES McCLIVE ANDREU McCALL WHO WERE SURPRISED AT PRAYER IN THIS HOUSE BY COLONELL DOUGLAS LIEVTENANT LIVINGSTON AND JAMES DOUGLAS, AND BY THEM MOST IMPIOVSLY AND CRUELLY MURTHER’D FOR THEIR ADHERANCE TO SCOTLAND’S REFORMATION COVENANTS NATIONAL AND SOLEMN LEAGUE 1685. The monument surrounding the gravestone was ‘erected by the voluntary contributions of a congregation who waited on the ministrations of the Rev. Gavin Rowatt of Whithorn’ on 19th August 1827. Rowatt, a son of the manse, was RP minister at Whithorn from 1826 until his death in 1832 – he was only 30 years old. Back in Stranraer, we went to Belmont Care Home, and put on a musical performance for the residents, before finishing with a time of psalm singing. After that, there was just time for a Chinese takeaway before the team members departed via boat, train and car. It was a memorable weekend for the congregation and we’re grateful to the GO team for coming and serving so willingly.